Felt is the oldest textile known to man, believed to be some 8000 years old. It is made without sewing or weaving and is a non-constructed fabric. There are many stories for the discovery of felt. One such story concerns a Prophet walking across a desert in the dim and distant past to preach to the ungodly. It’s hot and the desert is stony and his footwear is rubbing. A sheep passes him and he grabs a handful of sheep’s fleece to put into his sandals for adding comfort. The constant friction from walking and the moist and warm atmosphere in his shoe together with the sweat all results in turning the wool into a perfect pair of felt insoles. But this is just a story. 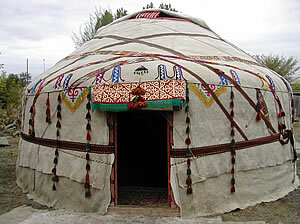 Felt has been used for many cultural reasons throughout the centuries and is very prevalent in Central Asia where it is used for everything from carpets to hats. Making felt is a very ancient craft skill. Felt is produced in many places in the world for such diverse items as shoes, tents, carpet, fine clothing, art objects, hats and jewellery. It is such a versatile craft that it will lend itself to many different treatments and new uses for it are being discovered by a new generation of artists and craftsmen. Most of the felt I make uses Merino wool, which is one of the finest and “felts” very easily. I dye my own wool and silk, which I use to make what is called ‘Nuno felt’. This is wool felted through a fine open cloth, like silk or muslin, to create more of a ‘drape’ for wearables. I also make felt creatures using a technique I call felt sculpting. I have recently started to make needlefelted sculptures which you will see in the gallery page.